The Swiss had plenty going for him heading into Sunday afternoon’s match at Arthur Ashe. For starters, he was 2-0 in major finals, having won the 2014 Australian Open and 2015 French Open in definitive, defiant fashion. Pushed to five sets only once leading up to the final, the Swiss had relatively rested legs. Equally and perhaps more important, Wawrinka had beaten Djokovic at both aforementioned tournaments, proving his mettle against the best even if so many seemed to want to write off his victories as more incidental than causal. Ahead of the match, as he does against so many of his peers, Djokovic had the better head-to-head record against Wawrinka, having won 19 times and lost only four. The five-set thriller in Melbourne two years ago could really have gone either way, with a fifth set tiebreak essentially becoming an exercise in attrition. This final shared much more in common with their match at the 2015 French Open, down to Djokovic capturing the first set and forcing Wawrinka to play from the back. For all of the furor surrounding Djokovic’s presumptive place in the final heading into the tournament, it is truly astounding how little tennis he actually played. In six matches preceding the final, the Serbian played 538 minutes, completing three and playing only thirteen complete sets as Jiri Vesely (walkover), Mikhail Youzhny (retired) and Jo-Wilfried Tsonga (retired) each saw their shots at the world’s #1 end prematurely. This would have seemed to benefit Djokovic, coming off a both disappointing Olympics and a wrist injury, but questions about rhythm and momentum may have overriden any medical benefit he may have received. In the first set, Djokovic strutted out to a comfortable 5-2 lead, and it began to look like one of his relatively standard displays of Grand Slam excellence. Decked out in his tournament-favorite rosy attire, Wawrinka pushed back, however, to force a tiebreak. Though Djokovic claimed the tiebreak rather handily to go up one set to none, Wawrinka had made it apparent that he was not going quietly into the Queens night. After straightening out his serve and cleaning up his unforced errors, of which he had 20 in the first set, Wawrinka played as well against Djokovic as anybody in the second and third sets, rarely leaving a point to go unchallenged, either through his play or via official dispute with the line judge. More often than not, it seemed he would go to the replay challenge simply to buy time for his tired legs, undoubtedly melting by the minute under the stadium lights. Both players had trouble forcing and executing on break points, with Wawrinka tiptoeing the line between deuce and advantage to a maddening degree. Each worked his forehand well, with a few questionable drops and volleys thrown in for good measure, and Wawrinka’s reliance on his backhand was prominent. On the nights when it is working, however, it is among the most dangerous shots in tennis, and it was working Sunday night. The U.S. Open crowd has a way of getting behind the older player, typically the presumed underdog, in matches. Djokovic had to plea with fans during his 2015 final against Roger Federer, and though he did not outright resort to that this year, Wawrinka’s emotional displays after draining points corralled the audience in his favor. In a game of inches, on exhausted legs and with the trademark look of a bewildered cockatiel forming his profile, the Swiss needed every extra push he could get, if only for his own benefit. 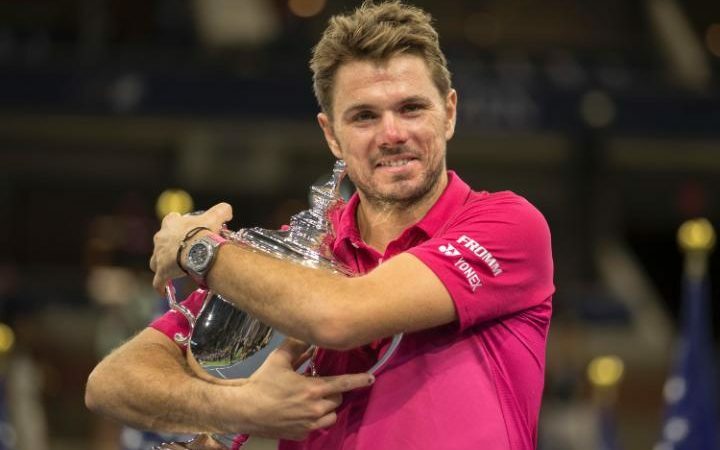 So now, at 31, Stan Wawrinka is a three-time Grand Slam champion, equaling the total of noted Big One-Quarter Andy Murray without all the heartbreak and anguish. Whether he wins another major is certainly up for debate; he’ll be 32 next March, and he has already broke Father Time’s serve to get this far. With more time to rehab, Djokovic will come back next season prepared to add to his total and remind us why he is the rule, and his opponents are the exceptions. For now, however, Wawrinka is on top, the king slayer having ripped the crown once more. By comparison, Wawrinka played 1,074 minutes in 23 sets, two minutes short of outright doubling Djokovic’s work. As pointed out to me by the very person who brought me to see Wawrinka earlier in this tournament, his Instagram account is, in a way, highly representative of his playing style: a little all over the place, with double exclamation points being deployed at the frequency of his backhand and wayward, lengthy strings of hashtags allowing him to dip a toe in many ponds without fully submersing himself into any. If ever there was an Instagram equivalent of a double fault, this seems like a suitable proxy. Surely, there is only room for one age-defying Swiss male tennis giant, right? Roger Federer spent his U.S. Open fortnight parasailing and hiding in caves, apparently. See you in Melbourne! Which begs questions surrounding Serena Williams (just a few, Serena is ageless, etc. ), given Angelique Kerber’s trot to the Open title and #1 ranking last week.